Sundays at Home ~ link party! What did you have last night? And what are you having next week? If these questions make you twitch a bit or conjure up unremarkable memories, then I have the course for you! My friend Sarah of She Hold’s Dearly just released a 90 minute course with materials on fabulous & easy meal planning. Read the blog post all about it HERE – or if you are twitching a lot click HERE to sign up right now. At the introductory price of only $42, it is a bargain gift to yourself and truly the gift that keeps on giving in the form of delicious, healthy easy to prepare meals for you & your family. 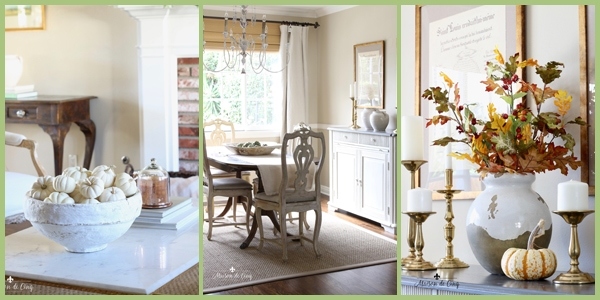 Colors of Fall Living Room Tour | Fabulous French Country Chandeliers & Where to Find Them! Copper pumpkins!! But yes, of course! We are definitely shining up our orange orbs with this copper pumpkin tutorial from Sanctuary Home Decor. Thanks for the terrific idea Karen! Jamie of So Much Better with Age wooshes in this week with flying bats in her cloches! Great way to contain and display these harbingers of Halloween. Fly over and get Jamie’s Halloween Bat Printable. 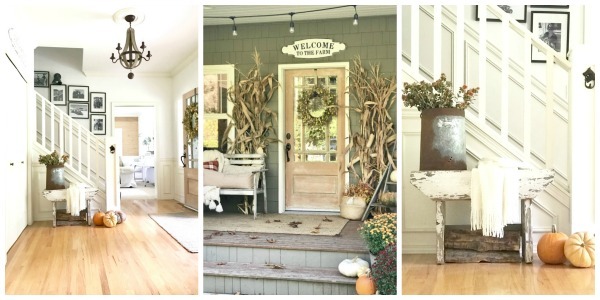 Autumn front porches are so delightful! This one from Andrea of Living on Cloud Nine surely hits the mark. 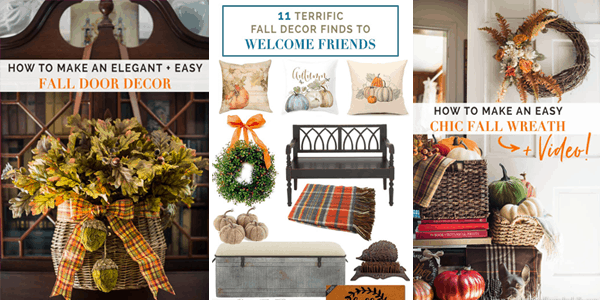 Click on thru and take a look at Andrea’s lovely & soothing fall front porch decor. Kelly, this is the best feature ever, thank you so much for all your kindnesses to me! My pleasure Sarah! I think your course will really benefit so many people. Meal planning is relentless & can be stressful. Great job helping to make life easier & mealtime more enjoyable! Thank you for hosting. Enjoy your week. Great features and thanks for hosting!…Have a wonderful week!